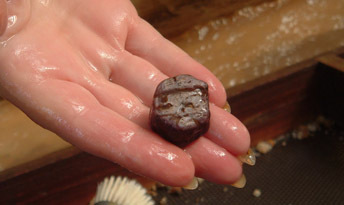 So, while enjoying your vacation cabin rental near Bryson City, you went on a gem mining adventure and found a beautiful native ruby or sapphire. Now what do you do with it? The stones themselves are interesting to look at but to the untrained eye, they just look like any other rock! When cut and mounted, however, they can be truly spectacular! There are many artisans in the area who will cut and mount the stones for you. Most mines will be happy to refer you to a gem artist /jeweler who is both dependable and talented. Here’s a link to one of our favorite artist jewelers. Keep in mind that the cutting process can sometimes take a few weeks, so your stone will most likely be shipped to you once you are back home. When a stone is cut, the artist must around imperfections and determine the type cut that will produce the most beautiful finished gem. The cut stone you receive will be much smaller than the stone you now hold in your hand. 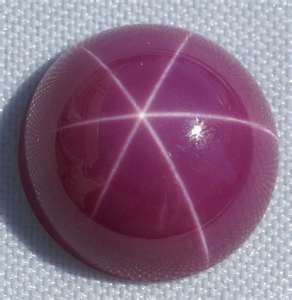 Some mines in the area are noted for a particular type of sapphire and ruby that produce six-pointed star when they are cut into a cabochon shape, with a smooth, rounded top. These are called Star-Sapphires and are considered to be rare. The star is the result of tiny inclusions that react with light, giving it a beautiful, lustrous star pattern. Jewelry made from gems you found yourself is special and fun to wear because it has a story and will always remind you of the wonderful time your had on your vacation in Bryson City or Cherokee, NC and your rental cabin from Yellow Rose. Happy polishing! While visiting the North Carolina side of the Great Smoky Mountains, there are many great ways to enjoy nature while getting a little dose of local history. One fun and exciting way is to try your hand at gem mining! Western North Carolina has a complex geologic history, resulting in rich deposits of beautiful gems and minerals that attract gem hunters, rock collectors, mineralogists and geologists alike. Thousands of people visit gem mines in Western North Carolina each year in the hopes of discovering their own unique treasures. Some truly incredible finds have been made over the years, including the 1070-carat Cherokee Chief Ruby and the world’s largest blue star sapphire. While there are mines throughout the area, the nearby town of Franklin, NC is known as the Gem Mining Capital of the World! Sapphires and rubies are both variations of corundum. Second only to diamonds in hardness, corundum is used as an industrial abrasive. Commercial mining of corundum began in and around Franklin in 1870 and was an important industry for many years. Tiffany’s showed an interest in the area in the 1890’s but because a steady, consistent source of corundum could not be found, they did not set up operation. Commercial mining continued until synthetic corundum became a cheaper solution for industrial needs. The mines were abandoned and forgotten until locals and tourists became interested in them for mining their own rubies and sapphires! We tend to think of sapphires as blue, but they can be green, pink, yellow and other colors. All colors of corundum are called sapphire except one: red corundum is always a ruby. Other precious stones commonly found in our area include garnet, amethyst, amazonite, beryl, jasper, moonstone, peridot, quartz, topaz, tourmaline, aquamarine and emerald. 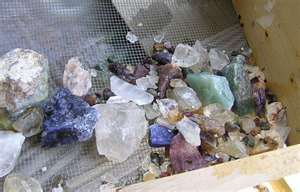 To learn more, visit the Franklin Gem & Mineral Museum, which offers free admission. Your Bryson City or Cherokee vacation cabin rental from Yellow Rose Realty is only a short drive away from one of many gem mines in the area. Why not take some time to try your luck? Who knows, you may just have the next big find! Stay tuned for our next installment about how gem mining works. Happy hunting!